Are you looking for challenging math problem solving tasks that keep your students engaged, apply the math you have taught, and meet the rigor of the Common Core State Standards? This resource is for you! This set of 3 math problem solving challenges can be used in a number of ways…as whole class explorations, as small group challenges, or as independent work for those students needing something more. In my classroom, these are often whole-class explorations where students work in teams, share ideas, guess and check their ideas—and then present their solutions. The problem solving and math applications are high level and meaningful. Because grade 2-3 students may not have experienced this type of problems solving before, I have offered the tasks with different types of support. In some cases, I offer different levels of challenge. In other cases, tables and other organizers are provided to help students see what work needs to be done and to help with precision and accuracy. Appropriate for grades 2-3, depending on skill level and level of support offered or for grades 4-5 for review or for less experienced problem solvers. Here are the 3 challenges! This challenge asks students to help pack apples into bags of different sizes. 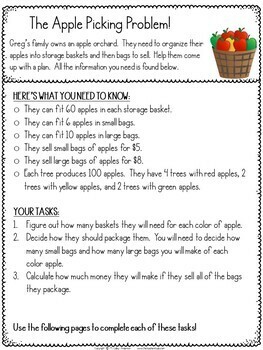 Students may use addition strategies or basic multiplication to help them find a way (and there are many) to determine how many apples they have in all, how many small and large bags to fill, and how much money they will make I all. This is a complicated problem with multiple steps, but one that could be solved with manipulatives or paper and pencil. 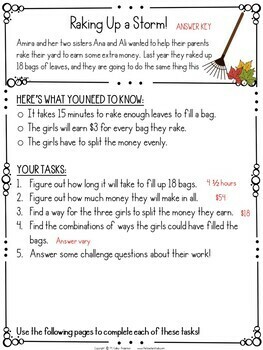 This challenge requires students to answer questions about three sisters who needed to rake up 18 bags of leaves. The task asks them to solve elapsed time problems, basic addition (including finding multiple solutions), and a basic division “sharing” problem. Please note that students may need coaching to understand that 30 minutes is a half hour and there are four “chunks” of 15 minutes in an hour. The Pie Making Party problem asks students to take a set of information (slices per pie) to find a way to reach exactly 200. Students could use manipulatives, repeated addition, subtraction, or multiplication strategies to come up with a solution. After they solve part 1, there are additional challenges involving solving problems with money. These problems are meant to take extended periods of time! Please allow students to work long enough to do high quality work! These problems often take 2-3 class periods...especially if you give ample work time, pull the class together to share ideas/troubleshoot along the way, share tips, and so on. Remember, part of “problem solving” involves “problems!” so don’t expect these to be easy for your students who are used to getting a solution quickly—or who expect there to only be one “right” answer! Celebrate great ideas and strategies… sometimes the process is more important than getting a correct answer in the end! Common Core connection pages are included, but know that students may use a variety of strategies to solve these so they are just “connections” to help you with your planning. Most answers vary because these are open ended challenges, but each task does have one page of more computation-based problems and the answers for these are included. Download the preview to see even more of what you get! 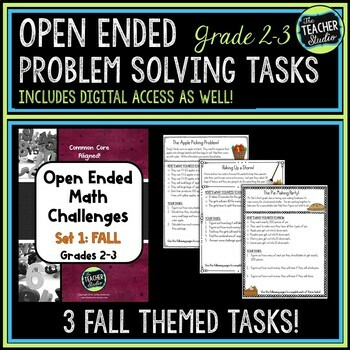 How about my open-ended challenges for grades 4-5? Set 1 can be found by clicking Here! Set 2 can be found by clicking Here! Set 3 can be found by clicking Here! Set 5 can be found by clicking Here! Set 6 can be found by clicking Here! The entire bundle of sets 1-3 can be found by clicking Here! The entire bundle of sets 4-6 can be found by clicking Here! Want ALL SIX? The "MEGABUNDLE" is now available by clickingHere! All rights reserved by ©The Teacher Studio. Purchase of this problem set entitles the purchaser the right to reproduce the pages in limited quantities for single classroom use only. Duplication for an entire school, an entire school system, or commercial purposes is strictly forbidden without written permission from the author at fourthgradestudio@gmail.com. Additional licenses are available at a reduced price.